When choosing plants for your aquarium it’s a good idea to have given some thought to layout and appearance and thus to choose plants according to their growth styles and patterns. This not only makes an aesthetically pleasing display but also makes ongoing maintenance much easier to manage. Foreground Plants – these are usually quite short and small and often form carpet-like matting at the bottom of your aquarium, through the production of several runner plants. These plants tend to be ideal for shallow aquariums because they need a lot of strong sunlight. Middle Ground Plants – generally taller than foreground plants, middle-ground plants are usually added for aesthetic purposes, hide the stems of the taller background plants. Background Plants – these are the tallest and grow extremely fast. They do not require as much sunlight and are often used to hide the accessories in the aquarium. Bunch Plants – these can be used as both middle and background plants and they normally look good in a group, hence their name. Specimen Plants – used as a highlight for the aquarium, these are large, decorative species that are often placed in the centre. Floating Plants – although they can be very attractive, these can require more care and maintenance and may not be suitable for beginners. Not only do they need to be kept away from the heat of the light bulb, they also need to be watched as they propagate extremely quickly, blocking out vital light to other parts of your aquarium. Selecting the right type and species of plant is very important, particularly when you are a beginner. In general, if you are new to aquatic plants, it is best to choose species that are not too exotic and/or expensive. Large, colourful specimens tend to be a bad choice for beginners and you are better to stick to green plants. This is because colourful plants require more direct sunlight but more light can also wreak havoc on the temperature and algae levels in the aquarium, therefore it is best to leave such delicate balances to more experienced and knowledgeable aquarium-keepers. Another thing to keep in mind is the availability – again, as a beginner, you are better to choose plants which propagate themselves and give off-shoots which develop into new plants. This means that they will be readily available in petshops and can be easily acquired should you need to replace any. Finally, unless you are very experienced, it is best to choose plants which are not easily eaten by your fish! Java Moss/Java Fern – one of the most common aquatic plant species and especially suitable for beginners. They are very hard and can thrive in a range of soft, hard and even brackish waters. They also tolerate a range of pH values. They self-propagate, so that new leaves plants form on the leaves of the existing plant and will either break away eventually or can be cut away and replanted. Thus, they grow rapidly and quickly give your aquarium a lush appearance. It is best to attach to a piece of driftwood or rock initially, until their roots have formed. Water Wisteria – this is a lovely plant that is undemanding to keep and ideal for your first aquarium. Like Java Ferns, it grows quickly and actually helps to inhibit algae growth – however, it can extract a lot of nutrients from the water so you need to be aware of this. If the leaves are pale, this indicates that there is a shortage of nutrients and you will need to add fertilisers to the substrate. Anubias Nana – another popular plant for beginners, this is an extremely hardy plant that seems to be able to thrive in all sorts of conditions. It flowers in water and is left alone by herbivorous fish as well. For best results, tie this plant to a tree root or stone. Lillaeopsis – this grass-like plant is a good choice if your aquarium is exposed to strong sunlight. However, it may not be suitable for beginners who have not yet learnt how to control algae levels as the strong light levels will encourage algae to take over the aquarium. Cryptocoryne Beckettii – for the more ambitious, this is a good plant to try. Although it is an amphibious plant, it grows well when submerged and comes in a variety of colours. 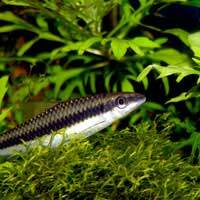 Amazon Sword (Echinodorus Bleheri) – probably the most popular aquarium plant of all, this is an easy solitary plant for both beginners and experts. It grows fast and is a good competitor for algae.